Every time I make a 100% rye sourdough, it sticks to the knife when I cut it even after letting it sit for a day before cutting. Is this normal? I have tried to vary the hydration ratio a bit, but it still behaves the same way. Is there some "additive" to make it less sticky? Is it a must to add wheat for that? The sourdough starter I maintain is simple: 2 cups of flour and 2 cups of water. I dissolve malt syrup, molasses, salt, and spices in a warm .5-1 cup of water. Then I add starter, 4 cups of flour, mix it and transfer right away into loaf pan. AFAIK there is no need to fold 100% rye bread and it raises fast. I bake it at 350˚F for slightly over an hour. I sometimes use Nu Wave infrared oven (40 min), but the very bottom is not quite crispy. The final bread looks and tastes good. But that stickiness on the knife and rolled "crumbs" are driving me crazy. Is there something I can do to minimize it? I heard that an over-proofed starter can help lower pH; helping pentosans keep bread structure and making them absorb less water. I tried making the bread with a well proofed starter, but it made no difference. Do I have not enough starter for that amount of flour? Shall I move some flour there to prevent pH from raising much? Here is the pic to get an idea. It is not the best one to show the issue. The bread is almost a week old and the issue is not as acute. For 1 day old bread, it sticks incredibly. One cause of gumminess in 100% rye breads is excessive starch degradation related to amylase enzyme actions. Amylase action is slowed down by increasing acidity. You can increase the acidity by adding a small amount of lemon juice or cream of tartar to your dough as described here. In his books "Whole Grain Breads" and "Crust and Crumb", Peter Reinhart comments that you can use ascorbic acid (1/8 tsp / 125 mg per loaf) to increase acidity and inhibit both amylase and protease activity. 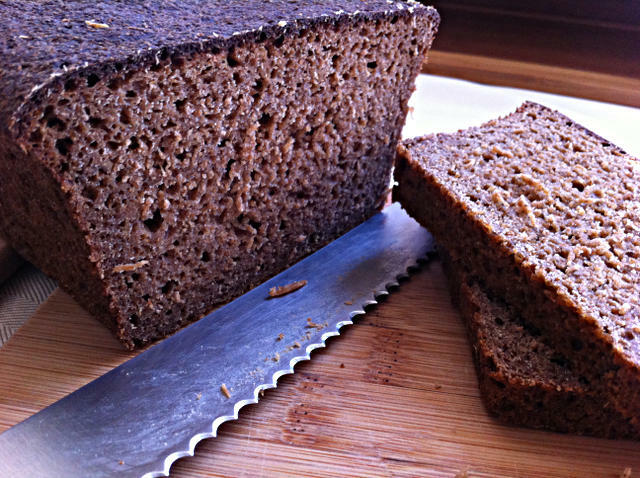 Since rye bread doesn't have significant gluten for structure, but instead relies completely on starches and pentosans, it is imperative to let the loaf cool completely before cutting it so that the starches crystallize and the gums solidify. Perhaps 350F for 15 min and then 325 for an additional hour and 15 (90 total), if the top is as black as it seems to be in the picture from an hour at 350F (sugars in there, so that makes sense - can't be too hot for too long with molasses, malt, etc. in the dough.) That's a starting guess, adjust as needed depending on results. Try steaming it instead of baking. Not the answer you're looking for? Browse other questions tagged bread sourdough cutting rye or ask your own question. Why does this sourdough recipe call for 2 and 1/3 cups starter? Isn't that too much?